Robert Silverberg is assembling a collection of 14 stories from Super-Science Fiction for Haffner Press. SSF launched during the sf boom of the mid-1950s. Paying a princely rate of 2 cents a word the magazine attracted fiction by Isaac Asimov, Robert Bloch, Harlan Ellison. James Gunn, Jack Vance, and Donald Westlake, and featured cover art by Frank Kelly Freas and Ed Emshwiller. Running for 18 bi-monthly issues (Dec ’55 to Oct ’59), the magazine eventually devolved into a publication capitalizing on the then-current craze of “monster” stories. Editor Silverberg traces the genesis of Super-Science Fiction from it’s beginnings as an outlet for numerous colonization/expedition stories to its conclusion with such stories as “Creatures of the Green Slime,” “Beasts of Nightmare Horror” and “Vampires from Outer Space.” It’s fun, it’s cheesy, and we’re really looking forward to it! Stephen Haffner plans to bring out the collection in 2011. 2) We look to be complete as of 3/29 with fulfilling orders for the limited edition of WORLDS OF JACK WILLIAMSON. It’s an amazing gathering of stories and essays of one of our favorite authors, and we hope you all enjoy the final product. In the category of “you-have-been-warned,” there are 10 copies still available. 3) We’ve added a 21,000-word story “Last Call from Sector 9G,” to our Leigh Brackett collection SHANNACH–THE LAST: FAREWELL TO MARS. It’s a peach! Brackett melds noir characters with a political SF setting. Wonderful stuff. 4) WITH FOLDED HANDS . . . AND SEARCHING MIND, THE COLLECTED STORIES OF JACK WILLIAMSON, VOLUME SEVEN is at the bindery and we look to receive copies on April 5th. 5) Be alert for some nice goodies to accompany the limited edition of DETOUR TO OTHERNESS. 7) An early peek into what HP is bringing to you in 2011: Contents are still being assembled, but Grand Master Robert Silverberg is editing a collection of 14 stories: TALES OF SUPER-SCIENCE FICTION! 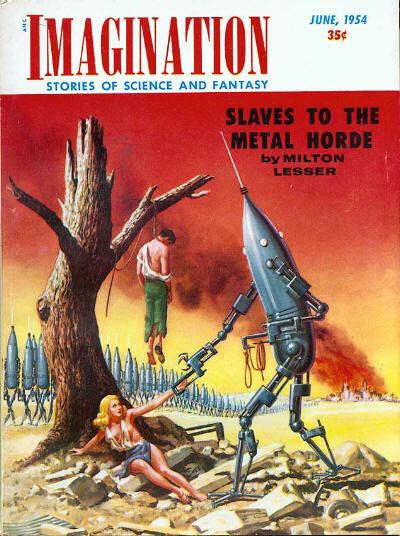 Super-Science Fiction was one of the many digest-sized magazines that sprang up on the newsstands in the mid-1950s. Paying a handsome 2 cents a word, Super-Science Fiction featured cover art by Frank Kelly Freas and Ed Emshwiller, and published fiction by Isaac Asimov, Robert Bloch, Harlan Ellison. James Gunn, Jack Vance, Donald Westlake, and more. Running for 18 bi-monthly issues (Dec ’55 to Oct ’59), the magazine eventually devolved into a publication capitalizing on the then-current craze of “monster” stories. Editor Silverberg traces the genesis of Super-Science Fiction from it’s beginnings as an outlet for numerous colonization/expedition stories to its conclusion with such stories as “Creatures of the Green Slime,” “Beasts of Nightmare Horror” and “Vampires from Outer Space.” It’s fun, it’s cheesy, and we’re really looking forward to it! 9) Remember to check out www.haffnerpress.com where you can cast your vote for our presentation at PulpFest 2010 (www.pulpfest.com). Which will it be? Captain Future or Leigh Brackett? You decide! That’s all for now. Keep your proton-pistols charged, your jet-packs ready, and your star-charts up to date. We’re all set for a big blast-off in 2010. And, oh yeah . . . This entry was posted in Like Show Business and tagged Haffner Press, Robert Silverberg, Stephen Haffner by Mike Glyer. Bookmark the permalink. And for all of the covers: http://www.philsp.com/mags/sf_s.html#super_science_fiction – click on the thumbnails for larger versions.